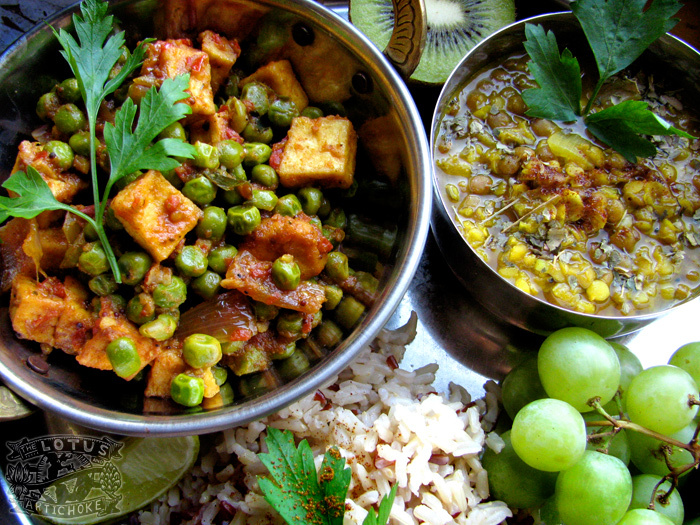 Mutter Tofu Paneer is the vegan Mutter Paneer – a peas and homemade cheese-cube curry, one of the most famous and popular North Indian vegetarian recipes and dishes. It’s on almost every menu of every Indian restaurant everywhere. But every cook makes it their own special way. I experimented with this dish several times a month for the year that I lived in India. Even if you aren’t a numbers whiz, you probably have the idea: Yes sir, Yes ma’am, I’ve cooked this dish a lot. I’ve also sampled dozens of different variations across the subcontinent and at Indian buffets throughout North America and Europe. The best Mutter Paneer ever? No question, no doubts: at homes eating with the family as an honored guest. Indians know how to make you feel like the most welcome guest in the world. Amazing food makes it easy.